﻿ The VISION Clinic was founded in March 2011 and provides ophthalmology services one half day per month. The clinic is held at the Truhlsen Eye Institute, 3902 Leavenworth St., and students have the capabilities to perform complete eye exams. 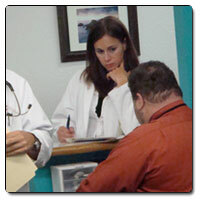 The Clinic accepts referral patients from the SHARING and GOODLIFE Clinics. Key to making the SHARING ophthalmology services possible was Dr. Michael Griess, formerly of UNMC Physicians Eye Specialists. "We are pleased to offer eye exams for our SHARING Clinic patients,” said UNMC medical student Tommy Muelleman who worked on developing the clinic.